Enjoy the wonderful parks our fine city has to offer! If you are planning a large family picnic, reunion or perhaps a small outdoor party that will require the use of a park shelter, we urge you to schedule your event with us! Shelter permits must be purchased in person (with identification) and will be available at the Parks & Recreation Office at 15800 White St, Allen Park, starting January 2, 2017. Permits for shelters are available May 1st thru September 30th only. No refunds or phone holds. Additional Shelter information, click here. Please note: Bathroom key available for an additional $10 cash deposit. Inquire at the Parks/Rec office for further information. (Bathrooms are kept locked). 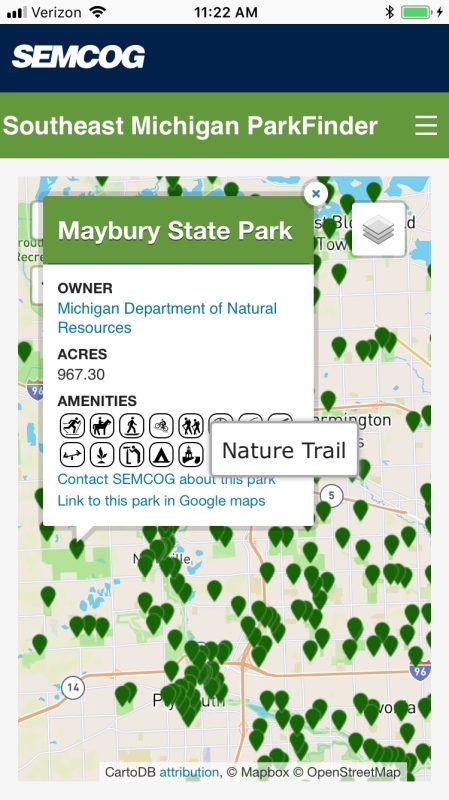 SEMCOG is excited to announce that Southeast Michigan ParkFinder is now available as a mobile app that makes it easier than ever to explore recreation opportunities throughout the seven-county region. We love this new tool, and we think your residents will too! Available free-of-charge on Apple's App Store and the Google Play store, the app enables users to search from over 2,600 parks within Livingston, Macomb, Monroe, Oakland, St. Clair, Washtenaw, and Wayne Counties. This interactive map is the result of regional cooperation and features everything from neighborhood playgrounds to state and national parks. A tip card to distribute at your community office and events. Place this button on your website with a link to ParkFinder. We are excited for your participation and look forward to your assistance in getting the word out to your residents. We especially hope you can find a place on your community's website to embed the ParkFinder link button. To ensure that information is accurate on ParkFinder, please alert us regarding any needed updates. As we continue to highlight assets and attractions in our regional parks system, let us know if you are interested in having your park(s) featured. Contact: Tyler Klifman, SEMCOG Plan Implementation at (313) 402-5251. To unsubscribe from receiving any SEMCOG information, click here.